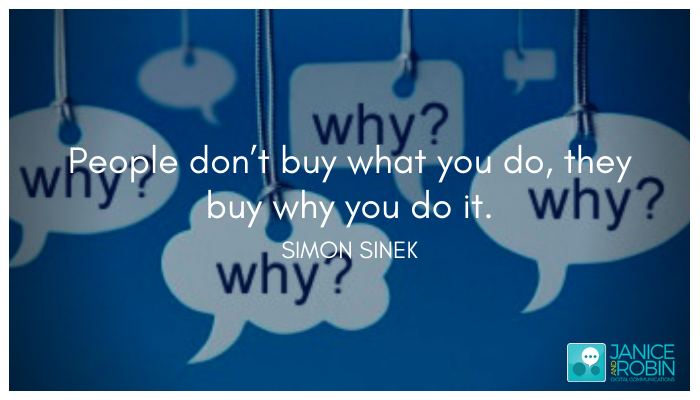 When you are telling the story of your organization do you include the ‘why’? Making sure that your customers, donors and stakeholders understand ‘why’ you do what you is essential in getting them to be part of your story. Too often organizations talk about what they do or how they make their product. This makes you the hero of the story. But when you are trying to engage with customers, wanting to get them to be part of your story YOU as the hero will only put them off. By talking about the why, your customer will see you you as their guide, guru or mentor. They will understand that you are there to help them, safely guiding them to achieving their goal. Look at your digital communications – your website, your social media, your blog posts – do you talk about the why? If not, why?